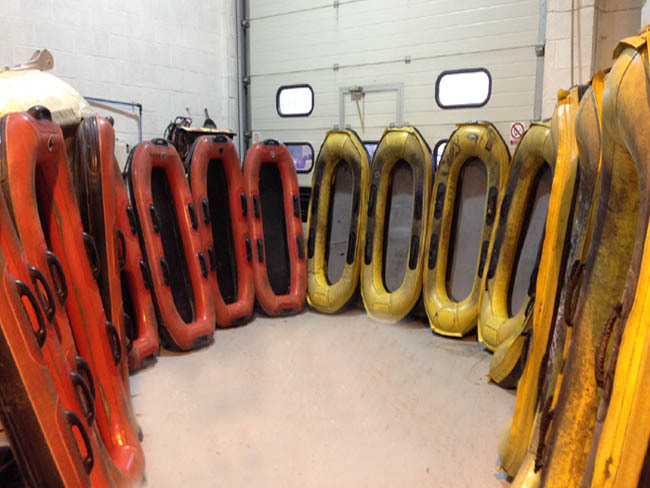 Water coaster inflatable dinghy servicing. At Rib Shop we are able to carry out a multitude of repairs & services - from handle replacements, valve repairs & replacements and valeting to punctures and complex repairs. We also supply the same products we use for repairs and valeting to companies who have their own in-house repair team. Due to our unique setup, we can work to tight deadlines, arrange collection and delivery, carry out one off repairs and also offer set price service agreements to ensure our clients are fully operational year round. Collective our small team has extensive knowledge and over 30 years of experience in the repair of inflatable products. We pride ourselves on offering the highest level of service to all customers.